There are few things as magical and potentially terrifying as water in the desert. Scottsdale’s Indian Bend Wash “Greenbelt” is one of many examples of how innovative thinking and citizen involvement transformed a nuisance to a civic treasure. Long subject to weeds, mosquitoes, and devastating flash floods that periodically engulfed neighborhoods along its length, the Indian Bend wash drains Scottsdale and areas north and east of us toward the Salt River in Tempe. The Army Corps of Engineers and the Maricopa County Flood Control District initiated a plan in 1959 to line the wash with a 170-foot wide, 23-foot deep concrete channel. Concerned citizens banded together with the City Council in 1964 to change that plan. It took until 1973 to begin the project in earnest. Another bad flood provided motivation for a $10 million city bond issue to be combined with federal funding for one of the first projects of its kind. Today, the Greenbelt enhances adjacent property values and quality of life for all residents. When I looked for a home in Scottsdale, being in a neighborhood adjacent to the Greenbelt was a non-negotiable requirement! I’ve been trying to tell friends and visitors about the Greenbelt for many years, but until now there was no single source of information about it and the great community gems it connects like diamonds on a necklace. Now some folks at the City of Scottsdale have put together an innovative, interactive Google map. Kudos! I made sure to post this link on our Take A Hike trails information page, too. You can see some of the interesting history (PDF, large file) of the Greenbelt on the City’s website. The Indian Bend Wash Greenbelt is an oasis of parks, lakes, paths and golf courses traversing 11 miles through the heart of Scottsdale. The greenbelt features more than 24 grade-separated crossings, meaning users can avoid major cross traffic. 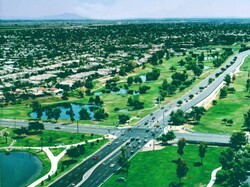 This world-renowned flood control project is rated among the top urban “green spaces” in Arizona. 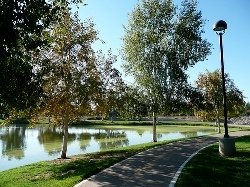 The Indian Bend Wash Greenbelt project transformed a serious flooding hazard into one of the Valley’s top residential and recreational areas. Discover how a community came together to forge a creative solution to a decades-old problem. I *love* the greenbelt! When we moved back to Arizona, living within a mile of it was a requirement I gave my realtor. He didn’t seem to understand my interest, but he got the job done. Learning the history behind it was a nice surprise. Thanks, John!